Craig Dworkin premieres his long poem “The Falls”: part lyric catalogue of the sculptural condition of everything beholden to gravity; part essay on French Modernism; part elegy; and part grammatical investigation into how we speak of falling into abstractions (love and sleep and illness) with concrete consequences. Chilean poet Omar Cáceres (1906–1943) wrote a single book, Defensa del ídolo, of which he burned all but two copies upon realizing the edition contained infuriating misprints. In a perhaps forged forward to the book, Vicente Huidobro wrote that the mysterious poet “examined the beyond with a stethoscope.” Mónica de la Torre aims too to auscultate the beyond by reading her versions of Cáceres’s poems as well as poems resulting from her interaction with the originals. 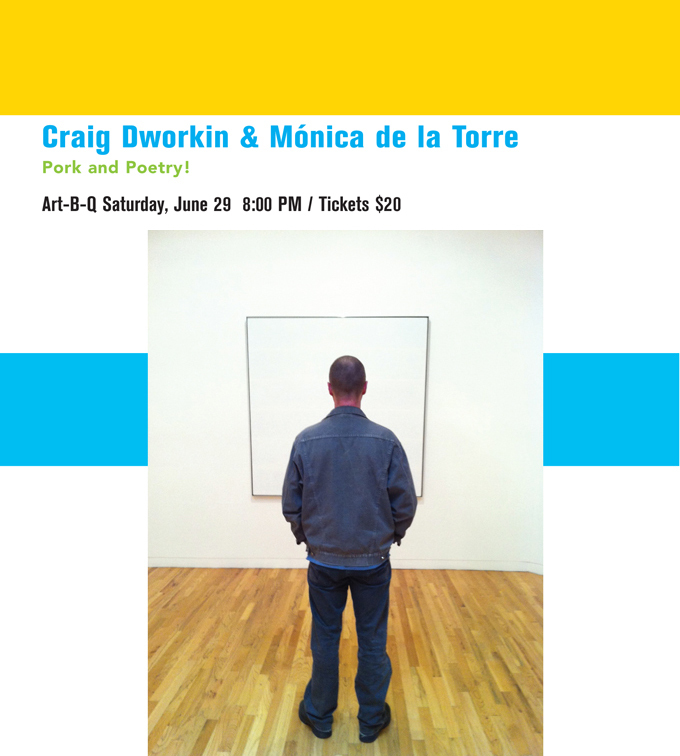 Craig Dworkin is the author of five books of poetry, including Motes and The Perverse Library. He teaches literature at the University of Utah and serves as Senior Editor to Eclipse. Mónica de la Torre is the author of five poetry books, among them Four and Public Domain. A native of Mexico City, she has translated numerous Latin American poets. She is BOMB Magazine’s Senior Editor.